Recent years have seen the balance of representation in music documentaries finally start to even out between male and female musicians and bands, though there’s a still a long way to go. It’s hard to argue that William E. Badgley’s portrait of The Slits isn’t long overdue. What stops this film being regarded in the same esteem as the stellar likes of Sini Anderson’s The Punk Singer, Barbara Kopple’s Miss Sharon Jones!, Sophie Fiennes’s Grace Jones: Bloodlight and Bami and, most famously, Asif Kapadia’s Amy is that, though it is a vital one, it’s just not a great film. Credit where it’s due to Badgley who wrote, produced, directed and edited Here To Be Heard: The Story of The Slits in a move that echoes the punk ethos and drive that forged The Slits in the first place. It’s just a shame that the innovation and artistry that The Slits were responsible for is so missing from the film about them. This is not to say the film isn’t without its merits. One of the aesthetic shortcuts employed by many contemporary music documentaries is the use of a faux scrapbook technique to collect and present archive photos and ephemera. However, here the story is told ostensibly by bassist Tessa Pollitt while leafing through her real-life scrapbook that is a faded but tactile history of the band. It’s a charming touch and Pollitt is a warm and thoughtful narrator. Unfortunately, the film doesn’t know whose story it should tell and so the result is disjointed. Sometimes it’s Tessa’s story, sometimes Ari Up’s, sometimes Viv Albertine’s and sometimes all The Slits, but it never settles in one place and as a result it feels too general, sadly. In the film’s defence, maybe just being a solid introduction to an important band is enough and it’s unfair to expect cinematic dynamism when talking about musical dynamism. That dynamism does feel lacking though. It’s right to talk about how important the band was but the film doesn’t really cover how good they were. One of the main travesties of The Slits is how they were written off as girls playing at being in a band – and later accused of not playing on their seminal record – but history has proven their debut Cut to be one of the finest records of the last 40-year period, not just one of the best records to emerge from the punk era. The film collects a brilliant array of voices including the band and their contemporaries and provides vital context from the moment of punk but it would have been great to hear from people for whom Cut was so pivotal, to see testimonies of the influence that is mentioned but never really explored to its fullest potential. It feels like a film of missed opportunities. In this moment one can’t help but wonder what a female director would have done with this story, or what a more experienced director would have done. Here To Be Heard: The Story of The Slits is a film that raises many fascinating questions about punk and immigration, about whether a band is a concept or specific personnel, about how and why voices are written out of history and have to claw their way back, but it never really tries to answer them. Again, maybe it’s unfair to throw all these what ifs at the film when it’s clear from Badgley’s contributions to the film and the lo-fi sonic and visual aesthetic of it that he was out there making a film that he believed in that there wasn’t a clamour to make from the people that should maybe have at least helped make it. We should be thankful because The Slits deserve that cinematic champion in the same way we should be thankful for Zoë Howe’s superb 2009 book on the band Typical Girls? The Story of The Slits. 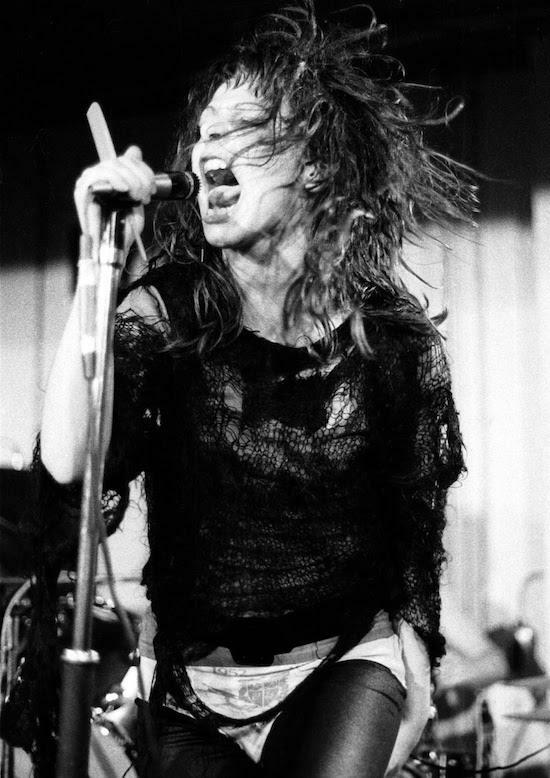 There’s a certain guilt in the duty to critique the work when it’s lacking formally because the more people that know of The Slits and how impressive they were and how vital their legacy is, the better. What are perceived as limitations in the presentation shouldn’t put viewers off, even if some of the composition and shot choices for interviews are baffling in the extreme. What matters ultimately, the power of the music and the personalities, still comes through with a bang. Plus, it’s great to have a documentary that includes such amazing footage and insight of one of the most under-appreciated bands Britain has ever produced.